Right this minute, there’s some intense competition going on in the HEDT space. AMD’s Ryzen Threadripper is proving to be a viable contender in a market Intel has long dominated, causing Chipzilla to mull the ways it could strike back. While Intel still tops many performance charts today, Threadripper’s price-to-performance ratio can prove much stronger – depending on the workload. I was genuinely surprised when AMD unveiled a 32-core processor last summer. It’s not that I didn’t think the company had the capability, I just couldn’t personally see it happening. It’s clear now that the company has become extremely aggressive. That’s why we see a 32-core option on its side, and an 18-core on the other (soon to be 28-core, when the Xeon W-3175X drops). 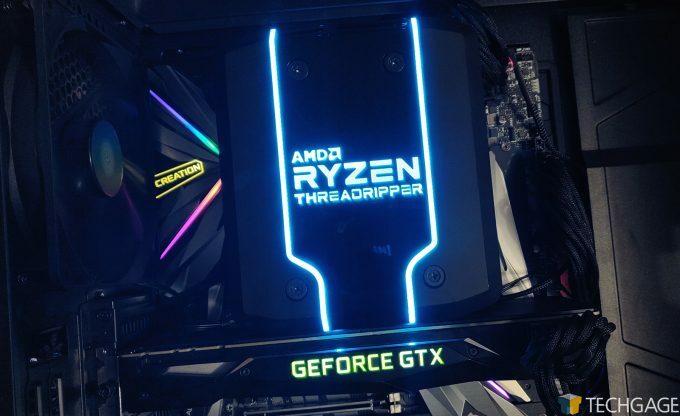 Even AMD’s first step down from the top of the Threadripper stack bests Intel’s current top core count chip for the desktop, with 24. Those 24 cores find themselves in the Threadripper 2970WX, while 12 others call the 2920X home. We’ve put these chips through the grinder, and have spit out some results across the next couple of pages to see how they measure up. For most people looking to build a capable workstation for all-around use, the Threadripper 2950X is probably the best choice in this lineup, as it offers a lot of value for its price. 16-cores isn’t market-leading, but it’s hardly unimpressive, especially at $899 (but regularly less at Amazon). The two biggest Threadrippers are best-suited for those with more specific workloads – namely, those workloads that will actually take proper advantage of as many cores that these chips offer. It’s not hard to find workloads that do scale amazingly on either of these chips, but their lower clock speed and less-than-ideal memory design (which increases latency) means they’re for specific users. If you want a better primer, I’d encourage checking out our 2990WX and 2950X launch review, as well another performance look catering to Linux, an OS that complements such a many-core architecture better than Windows (so far). This past fall, AMD released its Dynamic Local Mode feature. It helps manage intensive threads by making sure they’re being put on the cores that have direct access to the memory. We have a content piece coming up taking a look at Default vs. Dynamic Local Mode performance, and with the testing already done, we can say that it’s made almost no difference to our workloads (there’s one instance in particular where it helped, but not greatly). Just ahead of CES, a tool called Coreprio by developer Bitsum was released, which similar to Dynamic Local Mode associates the appropriate affinity at and after application load. 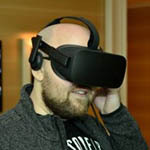 This tool will be tackled in the same article, and fortunately, I can say our experience with it has been more impressive than AMD’s own solution. That’s not to say AMD’s solution isn’t effective in some situations, but in our particular workloads, the setting didn’t change much. Coreprio, meanwhile, made a considerable performance difference in some scenarios, and in addition, general reliability of that performance was increased. If you are buying a 2970WX or 2990WX, we can already encourage use of Coreprio – but definitely do your own before treating it as a de facto solution for your specific needs.